Kirsty Money started playing the violin in Victoria, B.C., studying with Sydney Humphreys at the Victoria Conservatory of Music. She then spent seven years in Montreal, completing a Bachelor of Music degree from McGill University and working in the local music scene. She had the good fortune to work with numerous chamber ensembles including L’Orchestre Baroque de Montréal and Les Violons du Roy of Quebec City. In 1995 she met Lorand Fenyves and decided to pursue a Master’s degree in performance with him at the University of Western Ontario. Other studies include solo and chamber music master classes at the Banff Centre, the Summer Festival of the Royal College of Music in Manchester, England, and the National Orchestral Institute in the States. 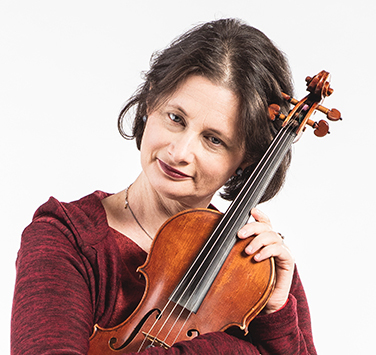 In 1999, Kirsty moved to Nova Scotia to take a first violin position with Symphony Nova Scotia. During this time she has pursued various collaborations, including work with songstress Janice Jackson, the Halifax-based band MIR, and more recently actress Pascale Roger and choral conductor Paul Halley. In 2001, she and David Greenberg founded Tempest, an innovative early music ensemble dedicated to bringing baroque music to life in the Maritimes. This has led the ensemble to become the orchestra in residence at Lunenburg’s Boxwood Festival and has also led Kirsty to pursue other early music collaborations with Alexander Weimann, Chole Myers, Daniel Taylor, and soprano Suzie LeBlanc. When not playing, Kirsty can be found in the North End of Halifax, running after her energy bombs Kyla and Eli. She is married to Ethan Neville, film director and editor for Centre East Productions. What do you do when you’re not playing violin? I do yoga, and look after my kids! I also like shopping in second-hand stores. The Tragically Hip, Concerto Caledonia, and Catriona McKay. Because my mother made me. I like finding hidden treasure.